The individual Worksheets, Leaflets and Formulations are available free in Adobe .pdf format from the Free Downloads pages. A folder of the Adobe .pdf documents can be purchased below. Most of the documents are also available in Microsoft Word format below. Some are not available for sale for copyright reasons, including NONE of the model specific formulations. Open the folder as usual to access the documents. See below for trouble-shooting if you have problems accessing the zipped folders. After purchasing any of the MS Word packs, you will be able to personalise the documents for use with your own individual clients, but the references and copyright should remain unaltered (you can add "edited by..."). The documents (whole or part) and their content must NOT be resold nor otherwise used for profit. Edited documents must not be shared on a website. Microsoft Word versions of over 50 of the Thought Records and diaries/log sheets. 200 of the documents available free on the Free Downloads pages, are available to purchase as a folder - easier to download! Only the documents for which I own the Copyright are available for purchase in the zipped/compressed folder. Presentation (Microsoft PowerPoint) Pack: 8 .ppt files. One presentation for each of the 7 steps of the self help course and an optional review session. 8 separate fully-editable PowerPoint Presentations of the complete 7-step CBT Self Help Course, with an optional 8th Review session. Also includes introductory guide. The freely available PDF booklet 7-step CBT Self Help Course can act as the course-book. Download the 7 step booklets here. All you need to run a CBT psycho-educational course! Approximately 20 slides per presentation. All 6 packs of documents, including the 4 packs of MS Word documents, the Adobe PDF packs and the pack of 8 powerpoint presentations. Getselfhelp.co.uk Cards are a pack of 52 cards to help you learn and remember self help techniques - for you, your family and your clients. The cards are downloadable in PDF format. There are 52 completed cards including 39 self help strategies and 13 inspirational and motivational quotes or sayings, plus one tips card and 3 blank cards making 56 cards altogether. 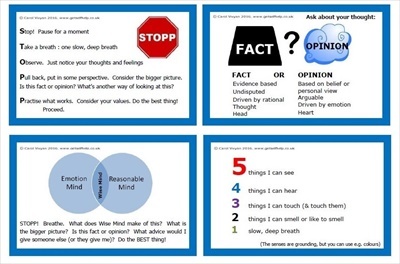 Use the Getselfhelp Values Cards to help identify your Values. A Value is a chosen life direction – something that guides us throughout our life. A Value is what we want to be remembered for. Our passion. Our Values give us meaning and purpose. Once we have identified what our Values are, we can take committed action to set goals and work towards those Values, helping us lead a more purposeful and enriching life. There are 52 word cards and 4 blank cards for you to add your own words, with 8 "cards" to each A4 sheet. Cut them them into individual cards. Use the Values Cards for yourself or with others. I have just downloaded your worksheets (all 3 packs) and I want to say thank you for such a goldmine of valuable resources for such a cheap price. If you are using a computer (PC or Mac), then you should have a programme which "extracts" the files from the zipped folder after download. Download and save the folder - choose and remember the destination! Go to the downloaded zipped folder. Right click and "extract all", or it may extract automatically when you try to open the folder. If you are using a mobile device, then it may be necessary to download the zipped file to a computer first, then extract the folder, before transfering the folder (or individual files) to your device using your standard programme. If you are STILL unable to access the zipped folders, please email me (email address on your purchase receipt) or use this contact form. I will then share the folder with you at SendSpace.com, so that you can download the files individually.